Ultimate fighting, a blood sport for the video game generation, has been one of the most sensational successes of 21st century athletics. The spectacle of fighters kicking, punching, stomping, elbowing and suffocating each other into unconsciousness has successfully pulled fans away from boxing. Its champions have become household names. And the sport's leading promoter, Ultimate Fighting Championship (UFC), has become all that professional boxing had ceased to be: well-run, well-marketed, with fighters who are seemingly happy to sacrifice their bodies and craniums for glory and relatively low pay. Elite gladiators endure punishment for somewhere between $250,000 and $500,000 a fight, the lesser-known pugilists receiving fractions of that amount. But the sport is now fending off a fusillade of blows from one of its biggest stars. 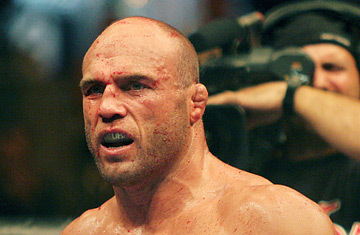 Randy Couture, 44, a five-time champion in two weight divisions and the sport's most public face, announced his retirement a few weeks ago. That surprised UFC aficionados and its executives, who believe he is under contract and can't retire. But what surprised them even more was the sucker punch Couture delivered on his departure. "I'm tired of being taken advantage of, played as the nice guy and basically swimming against the current with the management of the UFC," he said. "I have a lot of other things going on in my life that I'm doing just fine with. I don't need the problems. I don't feel like I get the respect I deserve from the organization." Later, at a press conference, Couture continued his assault, mostly griping about a lack of respect and contending that lower-end fighters are being taken advantage of financially. "Certainly there's personal motivation for resigning and taking a stand for myself," Couture has said. "If it sets a [precedent] that down the road requires athletes to be treated better, then that's icing on the cake." For those who do not follow ultimate fighting, Couture is the sport's Babe Ruth, a classy, soft-spoken gladiator who is nicknamed "The Natural." For fans, his endurance, toughness and proficiency embodies mixed martial arts, the technical name of the sport. Such is his fame that he is now making a foray into movies, with a lead role in Universal's The Scorpion King: The Rise of the Akkadian. UFC president Dana White went on the counterattack following Couture's statements. White, an ex-boxing manager, accused Couture of having a "puke Hollywood agent" giving him bad advice. At a press conference Tuesday in which he disputed Couture's claims, White said the fighter was paid $2.9 million last year, including a $500,000 signing bonus  even brandishing a canceled check to prove it. White was conciliatory as well, complimenting Couture as a great champion and expressing the hope that Couture would continue to defend his belt. But the UFC president insisted that the UFC takes good care of its own fighters, often giving them bonuses over their purses for particularly good fights. Lorenzo Fertitta, UFC co-owner, who typically shies away from the public spotlight, was also present at the press conference, claiming that Couture "misstated the facts and that his statements were meant to hurt us." Fertitta added: "When we bought the UFC in 2001, no one cared. We were losing millions upon millions. But fighters have always gotten paid, we never bounced a check. Our goal was to pay a fighter a million dollars. Little did I know that would be the start of our problems." To be sure, under White and Fertitta, Ultimate Fighting has gained a lot of respect. In the 1990s, critics like Senator John McCain were deriding ultimate fighting as barbaric, and the public was aghast at the mixed martial arts bloodbaths. The sport was banned in state after state. But the Ultimate Fighting Championship organization slowly built interest among young people, filling the void left by professional boxing, cleaning up the rules and marketing itself through the reality show The Ultimate Fighter on Spike TV. The show helped humanize the fighters, managing to coax nobility out of their quests for martial arts fame. Spike TV brags that seven live UFC fights on its channel in 2007 have, on average, attracted more young men in the coveted 18-34 demographic than other sports on cable like basketball, baseball, football, hockey and NASCAR. As ultimate fighting gained legitimacy, it created stars out of Tito Ortiz, Chuck "the Iceman" Liddell and Couture. Now that facade is beginning to crumble. Liddell, who was recognizable enough to have an episode of HBO's Entourage focused on him, has lost two fights. Ortiz has been in an ongoing feud with White about contractual issues. ("Until Dana White is ready to fight me on a professional basis," said Ortiz at one point, "I strongly urge him to keep his mouth shut.") And now comes Couture's outbursts about money and White's counterattack. "At the end of the day we treat our fighters right," says White. "The whole thing makes no sense. I felt like I got kicked in the throat." This is one no-holds-barred battle that Ultimate Fighting doesn't want.